Sunray’s cut-to-width polyurethane rollers are ideal for multiple applications. Sunray’s polyurethane tubing and cut-to-width polyurethane rollers are ideal for multiple applications. Cut-to-width polyurethane rollers are non-marking, quiet, oil and chemical resistant and can be made in various durometers. 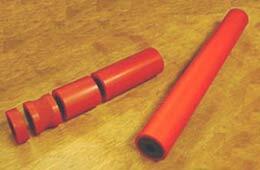 These unique urethane rollers are ideal to keep on hand in the event of an emergency application. Sunray’s standard cut-to-width rollers are produced in lengths of 20” and feature a hard inner core (70D) in black, and softer outer tread (90A) in red. These polyurethane rollers can be easily cut to the desired width and trimmed to fit. Sunray’s cut-to-width rollers provide instant solutions to immediate problems. U-groove, V-grove and treaded surfaces can be machined from all-polyurethane tubing, offering limitless possibilities. Order the cut-to-width polyurethane rollers you need through our online store by clicking a Part Number on the chart below. Need a custom polyurethane roller? Upload your CAD drawing files here! Click on the part number below to order! Don’t See the size you need? Click Here!